Do you need to sell your 4×4 as quickly as possible and for as much money as you can? Perhaps it is because the transmission has broken down and the cost of repair or replacement far exceeds the value of the vehicle itself. Or maybe the vehicle runs just fine but you need some fast money. There are many possible reasons for why anyone would want to sell their 4×4. Whatever it is, if you live in Perth or anywhere in Western Australia then your best bet is 4×4 Wreckers operating at Perth Auto Wreckers. We buy 4WD’s fast. And we pay the best money too. You don’t have to tolerate the amount of time and effort that normally goes into selling a vehicle anymore. Sell to us and get your car sold in one day! We pay top cash, which is evidenced in the maximum amount we pay being up to $15000. How much will we pay for yours? Find out! Get in touch with us by dropping us a line at 08 9452 8859. You can contact us online if you want to. There is a form on our main page to fill out that makes this a possible option for you. It is easy for the wrong conclusion to be arrived at concerning our purchasing habits. A lot of other Perth Auto Wrecking companies often trade only in one or a few makes or models. Some only want old models, some only buy Toyota. You get the picture. However, here at Perth Auto Wreckers we can assure you that we will happily purchase your 4×4 from you no matter what model it is. It could be years old, and it could be brand new. Or anything in between, for that matter. Imagine selling your 4×4 to a cash for cars service, and having to pay money to get the 4×4 in question to their salvage yard. The net result at the end of the day is less money. We think that this is a sub-standard system, and this is why we do things differently. What we will not do is ask you to transport the vehicle to our place on your own dime before we buy it. Another practice that you can be sure that we don’t take part in is carrying out the removal ourselves after paying you less money than your 4×4 is worth to make up for the cost. Those are practices that other cash for car services take part in. We here at Perth Auto Wreckers do things differently with unwanted 4×4 truck pickup. We will buy your 4×4 using the maximum amount of cash that your 4×4 can possibly be valued at, and then we will remove it free of charge. No extra charges, either hidden or up-front! Yet another reason for why we are the best. We offer same day pickup in Maddington, Perth, Malaga, Wangara, Welshpool, Armadale, Rockingham, Mandurah, Joondalup, Kwinana and Cockburn. After you sell us your 4×4, and it is a junk 4×4 that can’t be repaired for whatever reason, we take it back to our salvage yard. Once the vehicle is at the salvage yard, we will be wrecking it! This is an important part of every 4×4’s lifespan. It means that the parts and materials that make the vehicle in question up will still be in use in other cars and products. We dismantle the 4×4 and put all the parts that are re-usable into our used parts stock. These parts will be tested and reconditioned for maximum quality. This is how we are able to extract every last bit of value from broken down 4×4’s. We share that value with you when we pay you top cash in the first place for your junk 4×4! Is your 4×4 wrecked? Perhaps it is broken down. Or is it in a terminal state of disrepair? Maybe you just don’t like how it looks. Whatever condition your Ute is in, there is no way we will turn it down or reject it. That is not what we are about. We are all about taking in all the four wheel drives that are offered to us, and paying the best amounts of money for them. So if you have a beat up and broken down Ute, don’t hesitate to take advantage of our expertise and skill. You will be glad you did. These are just some of the makes of 4×4 that we buy: Hyundai, Mercedes Benz, Holden, Honda, Ford, Volkswagen, Audi, Mazda, Jeep, Land Rover, Range Rover, Nissan and Toyota. All 4×4’s will need to have parts replaced over the course of their lives. You will need to have a top notch source of used parts if you are to have your Ute or four wheel drive constantly in use. But it is always advised that one doesn’t resort to buying replacement parts brand new. Your 4×4 will most likely be a few years old, so you may as well get parts that are a few years old. Otherwise, you are just getting your cash and throwing it into the wind. Selling second hand 4×4 tyres at very affordable prices. It is a good thing, then, that you live in Perth. Because you have access to the best source of used parts. That would be us here at Perth Auto Wreckers. We have a huge range of second hand parts, all in great quality, and all at the most affordable prices. Get in touch with us at 08 9452 8859 and we will find the part you need, no worries. Warranties on selected parts can be either 30 days or 90 days so you are not taking any risk. 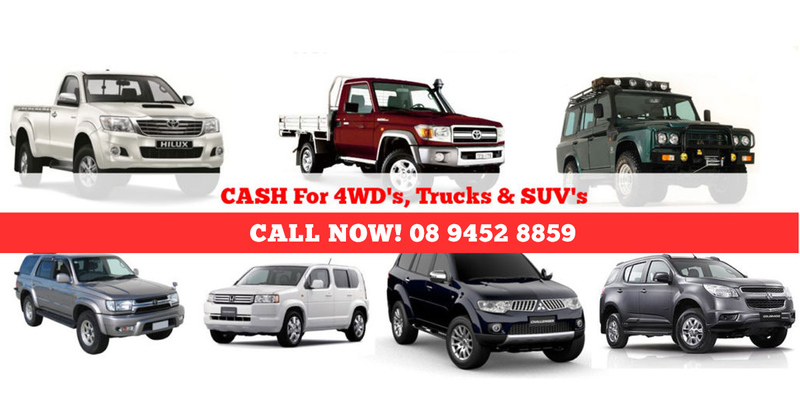 If you want to sell your truck and want to know how much we would pay for it, contact our 4×4 Wreckers in Perth. Give us a call, or you can find the quote request form that we have put on our website and fill it out. Tell us all about your 4×4, including the manufacturer name, what model it is, how old it is and what condition it is in. We will respond fast!